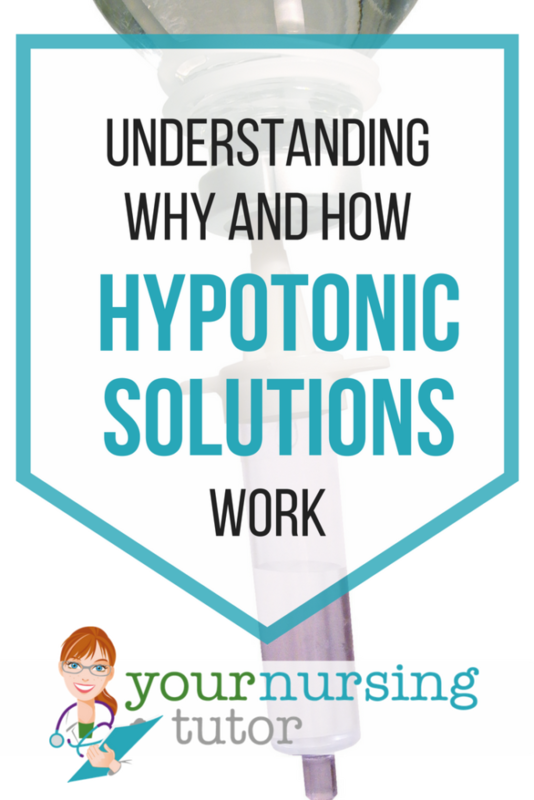 What makes a hypotonic solution…hypotonic? 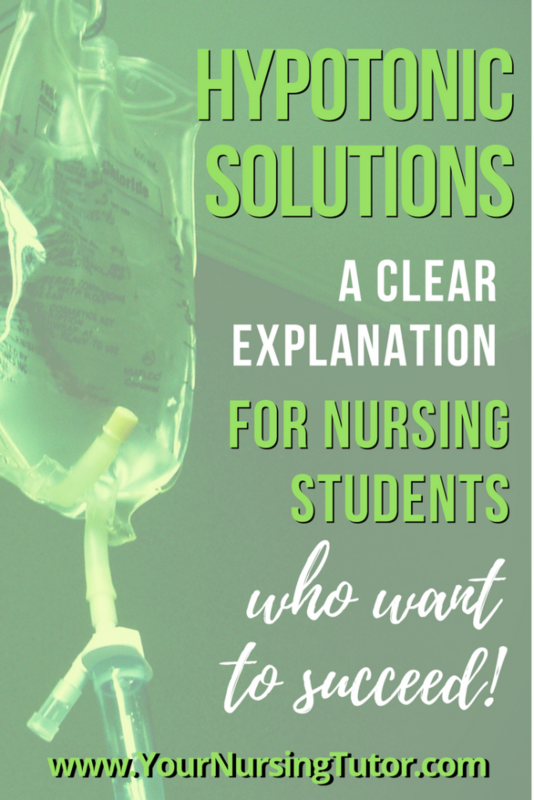 Here’s a clear explanation for HOW and WHY hypertonic IV solutions work so that you can be confident in knowing which situations to use them in during nursing school. If you haven’t already seen the explanation of results from my Osmosis Experiment, make sure to check that out first. It’s not only interesting, but I’ll be referring to it in this series of articles about IV solutions. 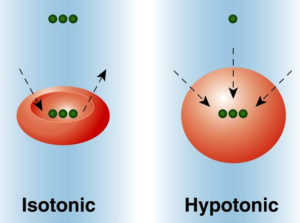 What is a Hypotonic Solution? Solutions ALWAYS have to be compared to another solution in order to determine their tonicity (hypo-, hyper-, or iso-). In nursing, we are almost always comparing things to the human body. In the case of IV Solutions, we are specifically comparing them to blood. What happens when you administer a Hypotonic Solution? If you want to understand what happens when you give a patient a hypotonic solution, it all comes down to osmosis and diffusion. Since hypotonic solutions have less “stuff” (my unofficial term for solute…) in them, their immediate effect on the body is going to be to dilute the blood stream. Let’s do a thought experiment to illustrate how hypotonic fluids work. If we gave a hypotonic IV fluid to a healthy patient without any blood imbalances, then the hypotonic fluid would end up diluting their bloodstream. This would lead to electrolyte imbalances in the “hypo” direction (i.e. hyponatremia, hypokalemia, etc) because there is now more water than “stuff” in the intravascular space. As a result, the excess water inside the blood vessels will want to move into: 1) the interstitial spaces, and/or 2) the red blood cells. Both of these locations are likely to have a higher concentration of “stuff” compared to the diluted blood vessels after the hypotonic solution has been administered. A normal RBC in a Hypotonic solution! If the water moves into the interstitial space, that can obviously lead to edema (and all the related complications) if it goes on for too long. And if the water starts to move into the red blood cells, then those red blood cells can swell like water balloons! (Again, remember that we’re talking about an otherwise healthy patient right now). Too much hypotonic fluid, and those red blood cells will start popping like water balloons, too. Now here is a situation where we often WANT to administer a hypotonic IV fluid! 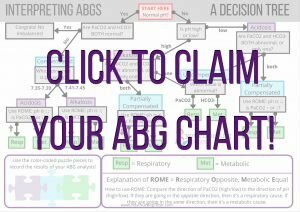 If a patient has diabetic ketoacidosis, their bloodstream is going to be overfilled with ketones and glucose, making it relatively hypertonic compared to normal blood. This is going to cause the water that’s already in the body to enter the intravascular space via osmosis as the body attempts to correct the fluid and electrolyte imbalance. And that water is going to be coming from two places: 1) the interstitial space, and/or 2) the red blood cells. Starting to see a pattern here? 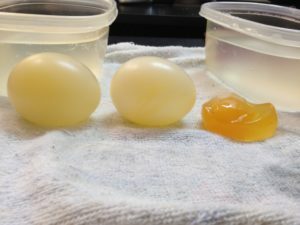 The red blood cells in particular are concerning, because they are basically swimming in a hypertonic solution…and you only have to take one look at what happens to an egg placed in hypertonic solution to see that it is not a good situation! Just like the egg, water will soon start exiting the red blood cells. Without any intervention, they will become severely dehydrated and likely start dying. In order to correct this imbalance, we might choose to administer a hypotonic IV solution with the intention of diluting the bloodstream and ultimately driving the water back into the red blood cells. Doing so will reduce the concentration of glucose, ketones, and other “stuff” in the intravascular space. Once the concentration of “stuff” in the intravascular space has been reduced, then the relative concentration of “stuff” in the red blood cells will be higher. This will cause water to start moving back into the red blood cells via osmosis. Then, as long as the underlying cause of the diabetic ketoacidosis is also being corrected, the patient’s body should be able to get back to homeostasis. Typically, if a patient needs a hypotonic solution then they will receive 0.45% Saline. The most common reason to give 0.45% Saline is probably for true dehydration. 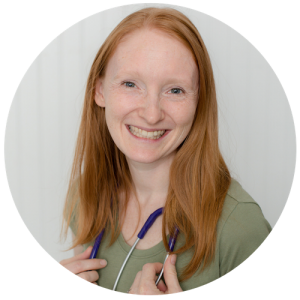 True dehydration occurs when the body has lost only water, without losing any electrolytes (this is different from fluid volume deficit, where the body loses BOTH water AND electrolytes). In dehydration, the body already has a normal amount of electrolytes, so there is no need to provide more electrolytes in the IV solution. The patient simply needs some of their water replaced! The 5% Dextrose Solutions, on the other hand, are technically isotonic. However, once the dextrose (aka sugar) has been absorbed by the cells, only plain water (or 0.225% saline) is left in the intravascular space. Both plain water and 0.225% saline are clearly hypotonic, so they will have the same effect as any hypotonic solution would. It will cause water to move out of the intravascular spaces, and into the blood cells and/or interstitial space via osmosis. I hope this gives you a better understanding of hypotonic IV solutions. Please leave a comment below to share one new thing that you learned about them!